There were several important reports on the U.S. economy released this morning. First, data from the Department of Commerce showed that personal income for Americans rose by 0.4 percent in January, better than the 0.3 percent increase economists had anticipated and the largest monthly gain since October. Over the past twelve months, personal income has lifted by 4.0 percent, the strongest reading on annual growth since September 2015. 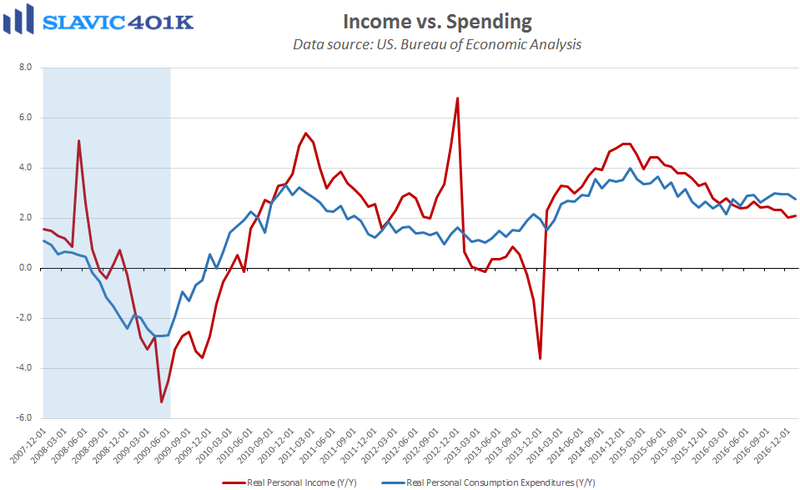 However, personal consumption expenditures (PCE), i.e. consumer spending, rose by just 0.2 percent in January, less than forecast and the smallest monthly gain since March of last year. Even worse is that after adjusting for price changes, consumer spending actually fell by 0.3 percent in January, the largest decline since September 2009. 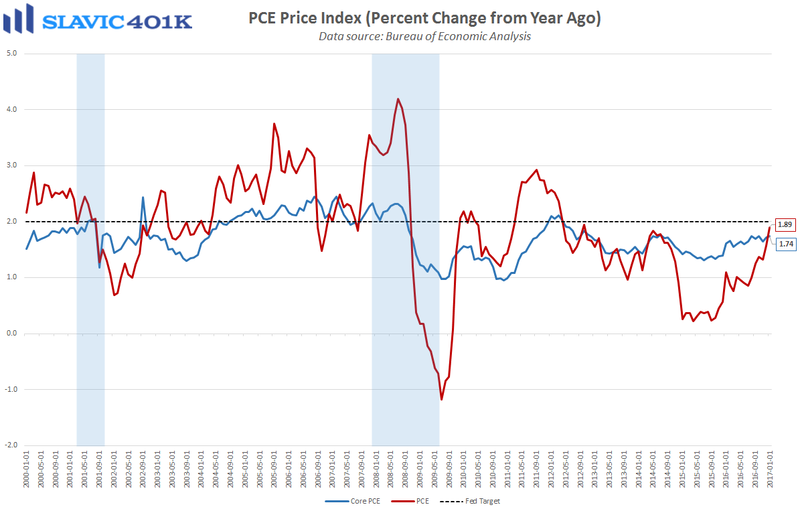 Speaking of inflation, the PCE price indices included in this report, the Federal Reserve’s preferred measures of consumer price changes, both climbed closer to policymakers’ 2.0 percent “target” in January. That will make it a lot easier for officials to justify another interest rate hike at this month’s Federal Open Market Committee (FOMC) meeting. 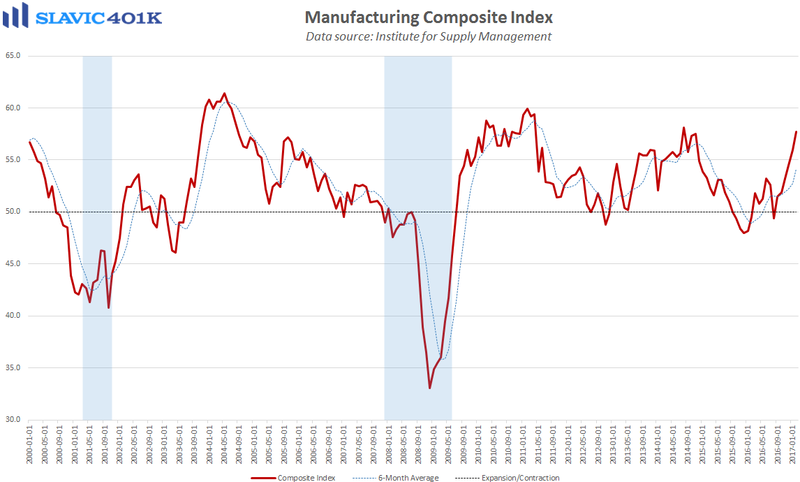 Next, the manufacturing purchasing managers' index (PMI) from IHS Markit ended February at 54.2, a slight pullback from the 22-month high hit in January. Under the hood, production and new business growth both moderated in February but surveyed managers still reported “increased client spending and efforts to rebuild finished goods inventories.” Inflation pressures across the manufacturing sector also eased last month but the latest rise in average cost burdens was still one of the fastest recorded over the past two-and-a-half years, according to the report. Chris Williamson, chief business economist at IHS Markit, added that “Even with the latest slowing, the goods-producing sector is still on course for its best quarter for two years, representing a markedly improved picture compared to this time last year … Manufacturing is far from booming, however, as the strong dollar means near-stagnant exports continue to act as a drag on growth.” Slightly more encouraging was the Institute for Supply Management's (ISM's) manufacturing index, also released this morning, which rose to 57.7 in February. That was much better than expected and the highest reading since 2014. 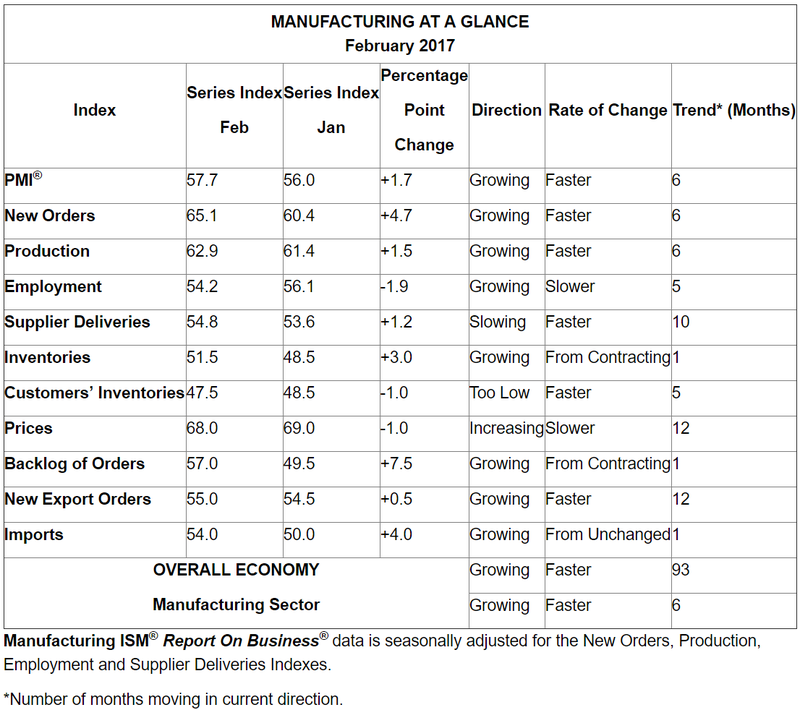 Measures of new orders and production improved last month but job creation slowed. Comments from surveyed managers were generally positive. 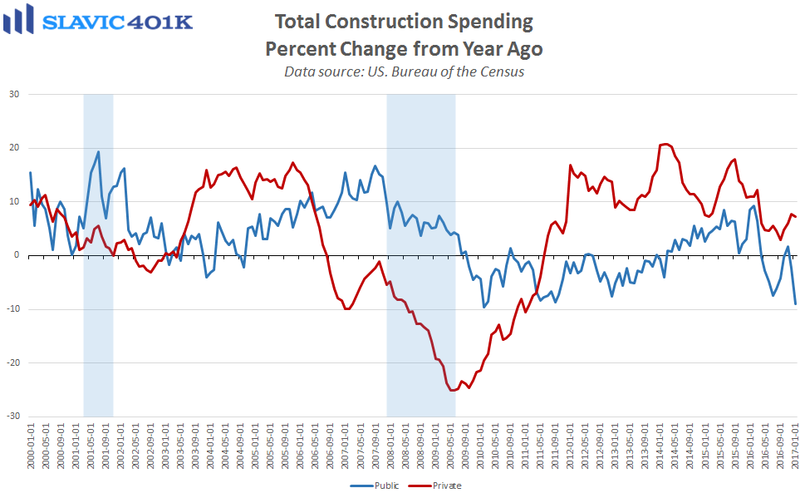 Elsewhere, a report from the U.S. Census Bureau showed that construction spending in America grew at an adjusted annual rate of $1,180.3 billion in January (lagged release). That was a sharp 1.0 percent drop from December’s upward revised print, the largest monthly decline since April of last year, and significantly worse than the 0.5 percent gain economists had anticipated. January’s decline also pulled year-over-year growth down to just 3.1 percent, the weakest reading since September. A big driver of the headline decline was public-sector construction spending, which plunged by 5.0 percent in January.